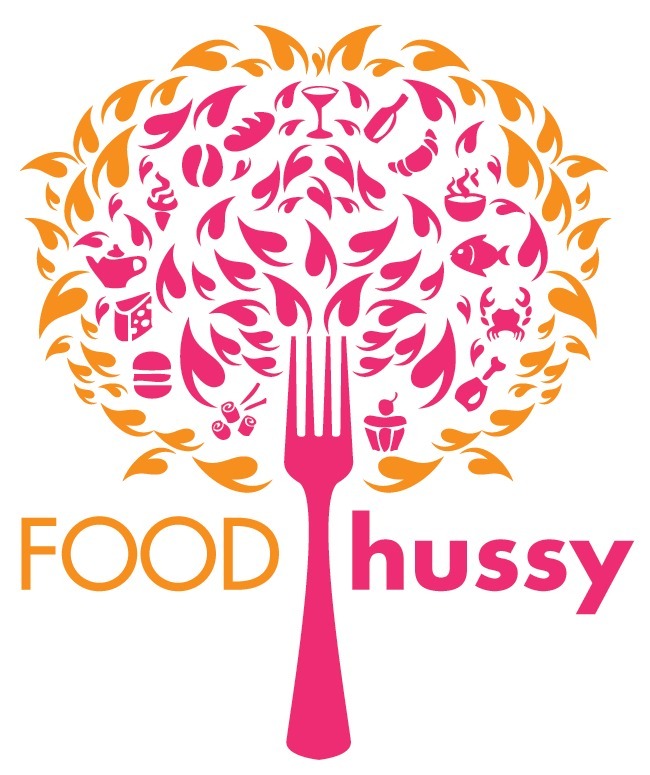 Recipe: Watermelon & Feta Salad with Grilled Tuna | The Food Hussy! Lately I've just been cooking for myself a lot - and when I do - frankly there's not much cooking! I'm too tired when I get home from work and I just want to eat and relax. But I have two things that I've literally been making AT LEAST once a week! 2. 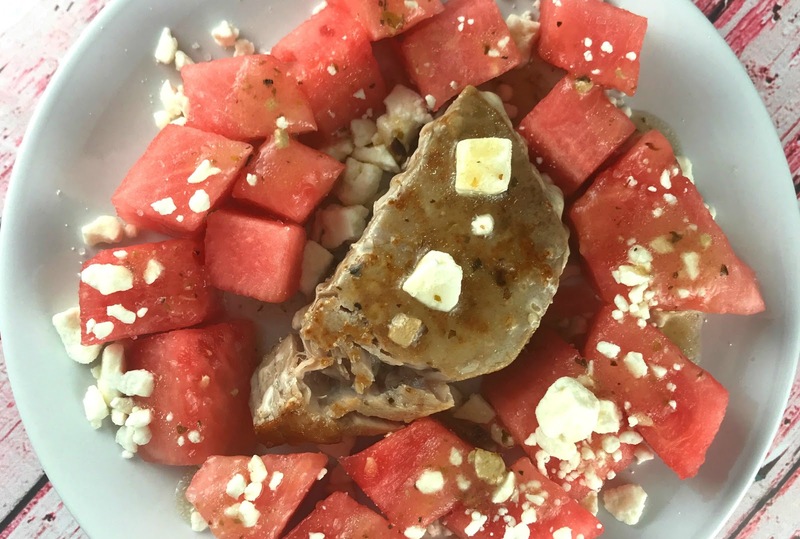 This watermelon & feta salad - sometimes I just eat that! But a lot of times - I'll grill a piece of seafood to go with it - most often tuna. This dinner is light and healthy and goes from fridge to plate in 10 minutes! I buy frozen tuna in individually wrapped packages and just take one out in the morning - and it's thawed by the time I get home. 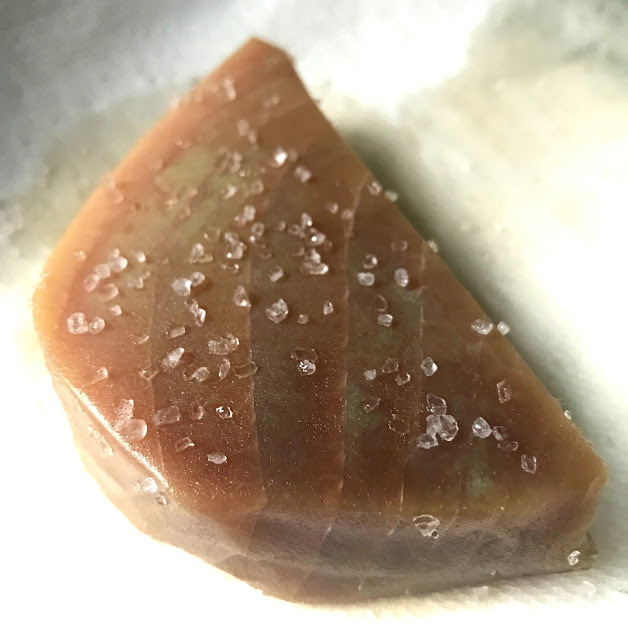 The only seasoning I use is a touch of coarse sea salt. I sear that in a little olive oil - 2-3 minutes on each side and that's it! I like tuna medium rare - but cook it to your desired doneness. 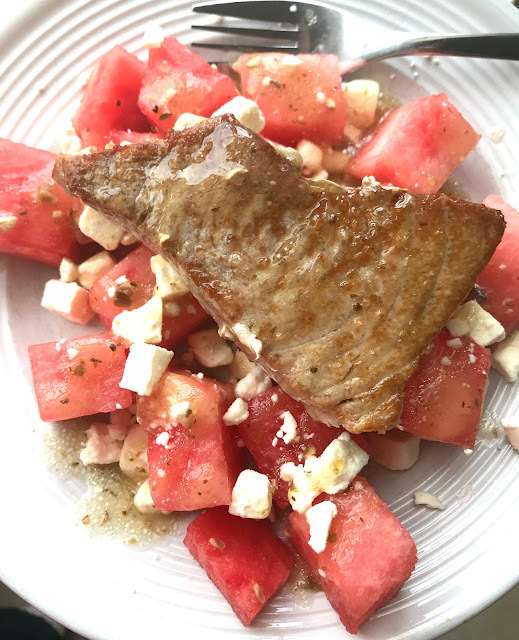 Plating is super simple - you just take about a cup (or more) of diced watermelon on your plate - top it with your seared tuna - sprinkle on crumbled feta and then top it all with a little coarse sea salt and your favorite Greek salad dressing. I promise - once you make this recipe - you'll add it to your regular rotation! 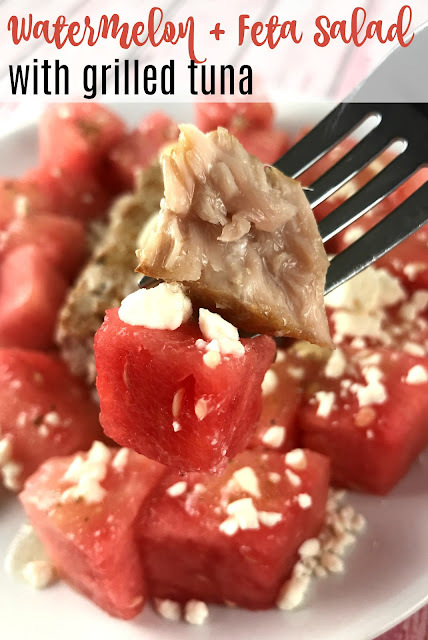 The watermelon is so light and sweet - it' pairs great with the salty feta and sea salt. The Greek dressing is my touch - I think it adds a little flavor that goes well with everything. Watermelon & Feta Salad is my latest obsession! Make it simpler with a splash of Greek dressing and entree it up by adding a piece of grilled seafood. Healthy & delicious!